Jim Morgan, Director of the North American Wind Research and Training Center, Ruth Ann Litchfield, Mayor of Tucumcari, and Dr. John Groesbeck, Mesalands President, sign the proclamation declaring Aug. 5-11 as American Wind Week. Mesalands Community College, Pattern Energy, and the American Wind Energy Association (AWEA) is holding a community Open House on Friday, August 10 from 2:00-5:00 pm at the North American Wind Research and Training Center. This family-friendly event is part of a national celebration of U.S. leadership in wind power and the benefits it creates for all Americans. The Open House is one of nearly 30 events happening in 16 states from August 5-11 in recognition of the second annual American Wind Week. During the Open House, community members will participate in interactive self-guided tours of the facility and the wind turbine. Refreshments will be served. There will also be a brief program starting at 2:30 pm featuring prominent speakers, including the Mayor of Tucumcari, Ruth Ann Litchfield and the President of Mesalands Community College, Dr. John Groesbeck. 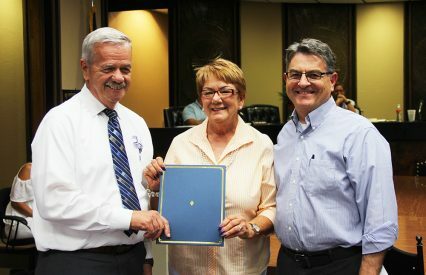 Last week, Dr. Groesbeck, Mayor Litchfield, and Jim Morgan, Director of the North American Wind Research and Training Center, signed a proclamation declaring August 5-11 as American Wind Week at the City Commission Meeting. Supporters of wind energy across the U.S. launched American Wind Week last year, when wind power became the country’s largest source of renewable energy capacity. Today, that leadership is growing with a record amount of wind power under construction at wind farms across America. New Mexico is an emerging wind powerhouse, adding wind power capacity at a faster rate than any other state in 2017. The state added 570 MW last year—a 51 percent increase over the 1,112 MW installed at the end of 2016. Wind farms supplied over 13 percent of the state’s electricity generation last year, enough to power over 422,000 average homes. New Mexico is now ranked 15th in the nation with 1,682 MW of installed capacity, and new investment in wind will soon advance the state’s leadership. Across the nation, a record 105,000 Americans work in wind power, affordably and reliably supplying over 6 percent of U.S. electricity, and creating clean air benefits worth more than $8 billion each year. Visit AmericanWindWeek.org to learn more about wind power and to see a full map of the week’s events. Share why you are proud of American leadership in wind power with #americanwindweek on social media.